Use window.applicationCache.update() manually to re-check manifest file. If manifest has been changed, Event updateready will be raised. You should handle it and call window.applicationCache.swapCache() then window.location.reload(). If you don't implement the process above, Some browsers never reload the page,and unable to change your web application. In the condition above, Use my Bookmarklet to force reload the manifest. If connection is HTTPS+ClientCert authentication, Safari doesn't load manifest and never cache it. User pushes Reload, Safari reloads manifest file and updates automatically. (Off topic)Mobile safari ignores .focus() method of input form since of security reason(maybe). To avoid, You have to enable apple-mobile-web-app-capable meta tag and bookmark it to home screen. focus() method is only working when it called via home screen icon. Chrome calls applicationCache.update() automatically but don't calls swapCache(). Application should call swapCache manually. If application doesn't have swapCache() code,The cached page naver be reloaded. You have to open chrome://appcache-internals and remove cache. 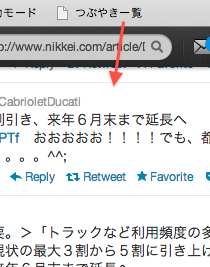 or Use my Bookmarklet . Safari fails loading cache.manifest or pages to be cached which needed Client Certification(Bug?). If you want to use cache.manifest on HTTPS with rejectUnauthorized:true, Bypassing authentication when accessing cache.manifest or pages which allowed caching is necessary. Refer following example. next()    //Authorize by cookie (such as express-session) for white list urls at this point. rejectUnauthorized:false   //Disable automatic authentication checking.